Are you feeling shortness of breath, heart palpitations, chest pain, or tightness? Do you know the signs of Coronary Artery Disease (CAD)? And if you’re experiencing them, are you taking steps to see your cardiologist to find out what the cause is? Many people, who have CAD symptoms, unfortunately, ignore the warning signs. Discounting heart irregularities can be fatal! And if you are experiencing any, the best time to have diagnostic testing is when these indicators are acting up. In today’s modern medical world, there are so many tests that can pinpoint exactly what’s wrong with our hearts; if only more patients would take advantage of getting tested to know where their risk factors and cardiac health fall, they would give themselves a jump start on living a much healthier life with greater longevity. Along with the standard electrocardiogram (EFG or ECG), stress tests, angiograms, echocardiograms, and monitoring devices, there is an advanced, non-invasive test offered by Radiology Regional Center called a Calcium Score. This test measures the amount of plaque in your arteries, and can calculate your risk of developing CAD. 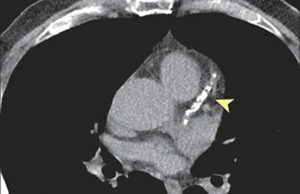 Computerized tomography (CT) calcium score scans are a precise way to detect atherosclerosis. The Calcium Score reading will determine the level of plaque in the artery walls and give the physician an accurate calculation of your risk of narrowing, blood-flow blockages, and the likelihood of future cardiac events. More importantly, it provides you with information to make preventative lifestyle changes or get treatment needed. If you have a family history of CAD, are over the age of 45, have smoked or currently smoke, have high cholesterol or diabetes and struggle with your weight, you could benefit from having this advanced test to measure your risk factors for a cardiovascular condition. Countless radiology centers use third-party radiologists that are not onsite and sometimes, not even in the same area. At Regional Radiology their radiologists are local and onsite and even more important, they are the most comprehensive group of fellowship-trained radiologist to include Women’s Imaging, MSK (musculoskeletal), body, neuroimaging, cardiac imaging, and interventional radiology in the region. Radiology Regional has 11 convenient locations from Naples to Lehigh to serve you, and they are all accredited by ACR and ICANL. Their convenient locations can accommodate same-day, walk-in x-rays, and scheduled appointments. When you arrive, the welcoming environment is different than larger, hospital-owned facilities and the knowledgeable staff works with you one-on-one to make you comfortable and prepare you for your test. But it doesn’t start there. Radiology Regional begins its personalized attention when they schedule your appointment to make certain that you are well- informed, ensuring the best results and outcomes. The intricate imaging isn’t rushed or taken lightly. Each patient receives care as if they were family. Given these differences, it’s also important to mention that Radiology Regional Center’s rates are often significantly lower than hospital rates, as their fee schedules are contracted differently by insurance carriers than hospitals systems’ fee schedules. Ask your physician to refer you to Radiology Regional Center for your imaging needs. Make your choice the best choice for you! To schedule your Calcium Score Test, please call 239-936-4068 in Lee County or 239-936-2316 in Collier County.